When you think of an office setup, you typically imagine a workplace equipped with the standard chairs, desks, and cubicles. However, in recent years, the introduction of standing desks and adjustable workstations has made a significant transformation on the office environment. With sitting no longer being the sole option, standing desks – used as a ‘healthier’ option and opportunity to break out of your chair without interrupting workflow – are even becoming a perk highlighted in job listings. In fact, research from the American Society of Interior Designers Foundation (ASIDF) showed 65 percent of respondents who received adjustable workstations reported increased productivity and 65 percent reported the workstations positively impacted their health outside of the workplace. A standing desk can only do so much for health and productivity, however – what’s even more important is what’s above that desk. It turns out, lighting has a tremendous impact on the workplace – not just on productivity, but our overall wellbeing. According to the U.S. Environmental Protection Agency (EPA), most people spend about 90 percent of their time indoors, leaving minimal amount of time for exposure to natural light. While windows can help bring us closer to integrating natural light into the office, most jobs – whether in a cubicle, classroom, hospital, bank, etc. – require working indoors, so the lighting we sit (or stand) under is integral to how we’re feeling throughout the day. Even more, how we sleep the night before plays a role in how we perform at work. Coming into the office groggy or tired, paired with insufficient lighting emitting on us for several hours, makes for a difficult workday. The body’s circadian rhythm – the internal clock that tells our body when sleep and when to wake – takes its cues from the sun. Because modern technology has outpaced human evolution, we depend on artificial lighting to provide illumination throughout the day and night. Unfortunately, most of this artificial lighting is too dim during the day and too bright at night, confusing our circadian systems and doing little to keep us functioning throughout the work day or help us sleep well at night. For instance, a study on employee health in work environments, conducted by the University of Twente, VU Amsterdam and CBRE showed a 12 percent increase in task performance when respondents worked under circadian lighting, compared to traditional lighting. Outside of task performance, a majority of respondents also felt happier and more energized when working under the right lighting. Factoring circadian rhythm into lighting development and design can significantly change the quality of work we produce, our moods in the office and our overall health and well-being. Beyond productivity, providing biologically brighter days and darker nights helps to mitigate social jet lag – a term used to describe the host of issues that arise from irregular sleeping patterns including fatigue, psychological stress and poor health. Depression, diabetes, obesity, and addiction to nicotine or alcohol are all conditions that have elevated risk factors due to social jet lag. The causes of social jet lag are hard to avoid, as common activities, such as going out to a restaurant, attending a concert, scrolling through social media late at night, and staying up to watch Netflix can play a role in irregular sleeping patterns. And, when we don’t take the proper steps to realign our biological clocks with our appropriate sleeping schedules, we start to experience the physical and mental stress associated with social jet lag, and that can have dire consequences. For instance, one study by American Academy of Sleep Medicine (AASM) suggests each hour of social jet lag is associated with an 11 percent increase in the likelihood of heart disease. There are several LED lighting providers in the market that boast promises to resolve issues with social jet lag and broken circadian rhythms. But the reason why current LED lighting is inefficient is because most lighting solutions ignore the recently discovered non-visual photoreceptors in our eyes that drive our core biological functions. This receptor, first discovered in 2001, is most sensitive to wavelengths of light in the “sky blue” region and solely responsible for sending signals to our bodies internal clock. These signals help our bodies delineate between day and night, allowing it to organize a myriad of biological processes, while reinforcing our natural sleep / wake cycle. The lighting providers that fail to recognize these new photoreceptors could even exacerbate problems created by social jet lag and lack of sleep. The architecture and design of a workplace is the foundation to productivity and work quality. Our mood, along with our physical and mental wellbeing, is impacted by several external factors. 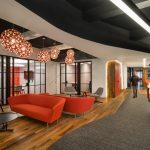 More progressive employers and organizations such as the International WELL Building Institute understand employees work better when their office environment supports a healthier lifestyle. Several companies recognize this need, and are providing snacks, discounts on gym memberships, and even regular retreats to spend time outside. Creating more space for windows and adjustable work stations like standing desks is also a great first step, but accounting for the time spent indoors under artificial lighting is key – and often overlooked – when making substantial improvements to workplace productivity. With most of our lives spent indoors, incorporating circadian lighting not only offers a viable alternative to natural light, but also positively impacts the overall health and happiness in an office. The next time you’re renovating, redesigning, or moving your office, consider lighting as an integral part of that change. Couldn’t agree more. I’d go as far as to say that lighting equals the atmosphere of the room. When we started renovating our offices, the guys at Superdraft – http://www.superdraft.com.au/melbourne-architectural-services – made a perfect balance of natural and artificial light. Why are ceiling lights in use when there is an abundance of natural daylight in places? Why use light absorbant dark carpet tiles within artifically lit areas? Why promote artificial lighting fitment/source to direct view & glare, discomfort issues? Why dark materials for tables & screens in darker internalised spaces? ‘Dark matter’ has a whole new space to play in. Funny universe we live in. Lights are considered one of if no longer THE most critical part of any indoors. it is the function which units the tone and temper of the interior, at the same time as additionally making it a realistic space for its favored feature, so it’s important that you spend the time to create a lighting fixtures setup inner of each and every interior to ensure that the room is perfectly suited to its motive. Lighting is one among, if not the foremost necessary a part of any interior. it’s the feature that sets the tone and mood of the inside, while additionally creating it a sensible house for its desired perform, thus it’s important that you simply pay the time to form a lighting setup inside every and each interior to make sure that the space is absolutely suited to its purpose.